Heroin is a highly addictive illegal drug. On the street, it is also called smack, horse, and H.
Heroin belongs to a group of drugs called opioids. It is made by chemically changing morphine, a natural substance found in opium poppies. It looks like white or brownish powder, which can be refined or lumpy. 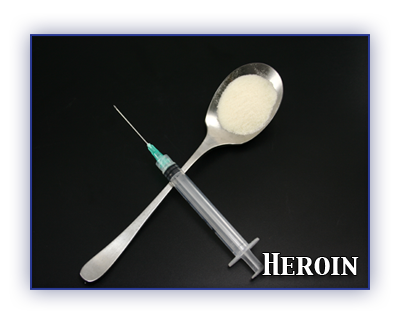 Street heroin can be pure or diluted (“cut”) with substances like starch, powdered sugar, other drugs or strychnine. Heroin can be injected by needle, snorted, or smoked (called “chasing the dragon”). It can be added to regular cigarettes or marijuana joints. Possessing, producing, or trafficking in heroin can result in fines, prison sentences, and criminal records. You can feel the effects of injected heroin in about seven seconds. When smoked or sniffed, the peak effects are felt in about 10 minutes. Heroin makes you feel intense pleasure (euphoria) and reduced pain. You can feel include nausea and vomiting, shallow breathing, constipation, itching, cold skin and sleepiness. The pupils of your eyes become smaller. Large doses can slow your breathing so much that you can slip into a coma and die. It is difficult to know the strength of street heroin, so overdose and death can happen easily. Heroin users who share needles risk getting bacterial and viral infections including hepatitis and HIV, the virus that causes AIDS. Injecting heroin regularly can lead to problems like collapsed veins. Smoking it often can lead to pneumonia and other lung problems. Loss of appetite can result in malnutrition. Chronic constipation is also common. Women can have irregular periods and men can become impotent. If you use drugs often, you can develop serious personal problems. Using drugs can become more important than your family and friends. You may continue using even when your job or schoolwork is suffering, or when you run into financial, spiritual or legal problems. Young people who use drugs heavily may not learn how to solve problems, handle their emotions and become mature, responsible adults. Babies born to heroin-addicted mothers are often premature and underweight, and go through withdrawal at birth. They can be infected with HIV, hepatitis and blood poisoning. If you use heroin regularly, you develop tolerance. This means you need more and more to feel the same effects. Eventually you become dependent on it. You can’t cut back or stop using it because you feel so bad when you try. All your thoughts are about how to get more. When a dependent person stops using heroin, withdrawal symptoms start a few hours later. These symptoms include restlessness, yawning, runny nose, tears, diarrhea, cramps, goose bumps, low blood pressure and strong craving. These effects get stronger for two to four days, and then gradually weaken. Depression, weakness and stress can last for several weeks or months.